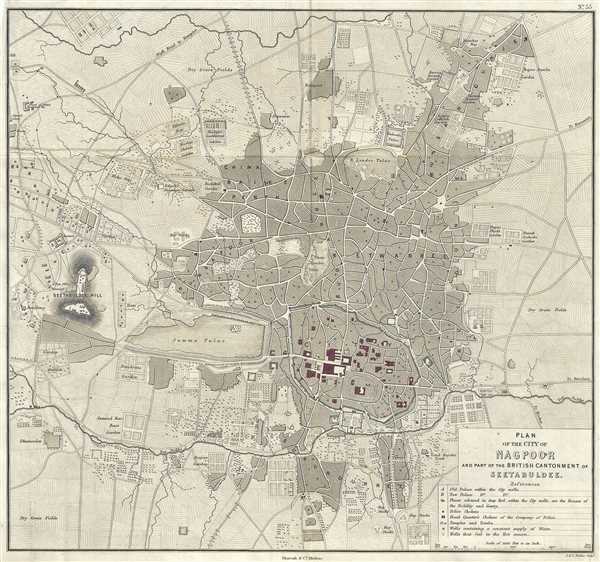 19th century map of the city of Nagpur, India. Plan of the City of Nagpoor and part of the British Cantonment of Seetabuldee. This is a beautiful 1854 Pharoah and Company map of the city of Nagpur in the Indian state of Maharashtra. It covers the entire city in detail noting streets, gardens, lakes, fields, rivers, palaces, temples, tombs, police stations, wells, important buildings, and topography. Seetabuldi Fort and hills are identified. This map was engraved by J. and C. Walker and issued as plate no. 22 by Pharoah and Company in their 1854 Atlas of Southern India. Very good. Minor foxing. Minor wear along original fold lines.